Real Madrid will reportedly look to make one last deal before the transfer deadline with former ace Mariano linked with a return from Lyon. The 25-year-old left the Bernabeu last year after struggling to establish himself in the senior squad, scoring five goals in 14 appearances in the 2016/17 campaign, albeit predominantly coming in the Copa del Rey. Having moved to France last season, he scored 21 goals in 45 games, and it appears as though he has caught his former club’s eye as Mundo Deportivo report that Real Madrid could swoop for him in a deal that could cost €20m. It would be a blow to Sevilla as the report adds the La Liga outfit were closing in on a deal for Mariano, but given that Madrid have an option on him, they seemingly hold the advantage but must make their decision in the next 48 hours. Los Blancos saw talisman Cristiano Ronaldo leave the club earlier this summer to join Juventus, and with just days remaining in the transfer window, they have yet to replace him. 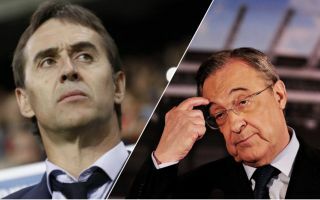 Julen Lopetegui appears set to give more responsibility to the likes of Gareth Bale and Karim Benzema along with Isco and Marco Asensio, but given Ronaldo scored 44 goals in 44 games last season, it may still be a sensible idea to strengthen in that department before it’s too late. Things have started well in the league for Madrid given they’ve won both their opening games and scored six goals doing so, but time will tell if another attacker is added to the squad before Friday’s transfer deadline and whether or not it’s a reunion with Mariano that is considered the solution by Lopetegui and the hierarchy.